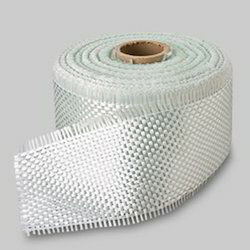 Manufacturer of a wide range of products which include fiberglass tape. We are actively engaged in presenting an extensive array of Fiberglass Tape for our clients. Designed to expand and contract, these tapes can withstand continuous exposure of 1200°F / 650°C and has low thermal conductivity coefficient. These are used for industrial ovens, furnaces, high-temperature tying and lacing cords, crucible packing and pollution control equipment. We are offering this product at very leading price across the market as per the need of our clients.